Three varsity girls soccer players jump to head the ball off of a corner kick on March 16. 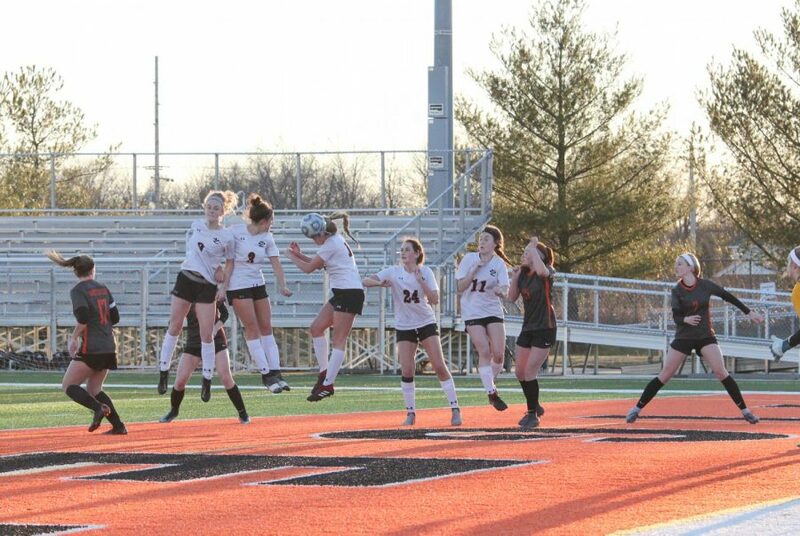 After a weekend of rough losses and miserable weather, the girls soccer team returned home Tuesday night to face Belleville West and restored some hope with a victory. The Tigers took the win with a goal in each half and played strong defensively to finish the game 2-0. This game was an important conference win. Currently, the Tigers are 6-6 overall and have been focused on working together to combine their defensive and offensive skills to create on-field chemistry. After last week’s game against Belleville East that ended in double overtime with penalty kicks, the Tigers knew they were doing something right, and they just needed to maintain that mentality. The first half of the game started with an early goal from junior Hannah Bielicke only ten minutes in. Bielicke has been a top goal-scorer for the Tigers in past varsity seasons. As an aggressive, forward she worked to outplay Belleville West. In the latter half of the game, the score quickly showed an assuring advantage for the Tigers as senior Emma Sitton took a pass up from mid-field to score an unassisted goal. This was Sitton’s second goal of the season. Sitton and Bielicke were both out for the beginning of the season, and their return has been great help to the Tigers. Later this week the Tigers will try for another conference win against Alton who is currently second-place in the conference at 2-1.